DENVER (Reuters) - Convicted mass killer James Holmes has been moved to a high-security unit at a Colorado prison to begin serving his life sentences for murdering 12 people at a cinema in 2012, corrections officials said on Friday. Holmes is being held in "transitional housing" at the Colorado State Penitentiary in Canon City until he is permanently placed, said Adrienne Jacobson, spokeswoman for the Colorado Department of Corrections. Holmes, 27, was convicted last month of murdering 12 moviegoers and wounding dozens in his July 2012 rampage inside a Denver-area multiplex during a midnight screening of a Batman film. The jury of nine women and three men rejected the former neuroscience graduate student's plea of insanity. But they spared him from the death sentence that prosecutors had sought after the jurors could not unanimously agree he should be executed. Arapahoe County District Court Judge Carlos Samour sentenced the California native to a mandatory dozen consecutive life sentences with no chance of parole for the 12 murders, plus the maximum possible 3,318 years for attempted murder and explosives charges. The gunman's court-appointed attorneys have said they will not appeal his convictions. 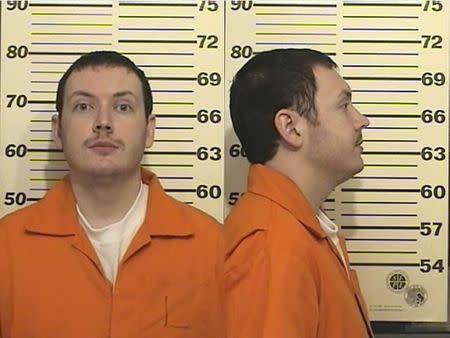 Holmes is classified as a "close custody offender," the highest level for new inmates, Jacobson said. The designation means he has limited privileges, such as no-contact visits and restricted movement within the complex, which is located about 90 miles (145 km) southwest of Denver. According to a corrections department document, the unit where Holmes is held provides "an increased level of housing, supervision and control to maintain the safety of the public, staff, volunteers and offenders." Jacobson said Holmes is in a single-inmate cell but is not in solitary confinement nor in a maximum-security block, which are reserved for inmates classified as dangerous because of their behavior behind bars. Holmes was moved to the prison last week from an intake facility in Denver, Jacobson said, adding it is unknown where Holmes will ultimately be incarcerated. Because of his high profile, the Holmes is at risk from other inmates, and authorities have said it is possible he could be moved out of state. During his trial, a video was played of Holmes telling a court-appointed psychiatrist after his arrest that other prisoners at the jail where he was being held had called him "a baby killer and stuff." The youngest of his victims was 6-year-old Veronica Moser-Sullivan, who died after being shot four times.